if you make your reservation through our web only you will pay 6€ for each breakfast! The rooms are spacious, comfortable and renovated. And all have free Wifi fiber, bathroom with hairdryer, air conditioning, Led TV with connection for PC, Movistar +, minibar and safe. Buffet breakfast, continental, special for celiacs and coffee for early risers. From 07:30 to 10:30 hours enjoy one of the most varied and complete breakfasts you can find in Pamplona. Good Morning! We are a modern and functional hotel located in the heart of Pamplona, next to the Plaza de Viana and 3 minutes walking from the Plaza del Castillo, Estafeta street, the Town Hall Square or the Plaza de Toros. Our customers have a 30% discount on the parking in the Plaza del Castillo, located at 150 m. Of our hotel, in the San Ignacio Avenue and with exit to the Castle Square, nerve center of Pamplona. We are in the center of Pamplona, 5 minutes from Plaza del Castillo and Estafeta street. We have renovated rooms with free Wi-Fi. We accept pets, we are Dog Friendly! We are a good option to come to Sanfermines, during the Camino de Santiago or to enjoy the rich skewers and gastronomy of the Navarrese capital. In this hotel we find ourselves at home. Excellent food, unbeatable treatment, very well informed of the most beautiful places to visit. Their people are very cheerful, we share with them very beautiful moments. We have been for two nights in this hotel. It is very close to the bus station and five minutes walk from Casco Viejo. Room spacious and comfortable. Silent. Value for money very good. Attentive and helpful. The location is excellent, the omelet is worthy of its prizes and the staff is worthy of mention (Isabel’s warm welcome, attentive explanations about the city of Pablo and the cordial treatment of Marcos as we leave the hotel). 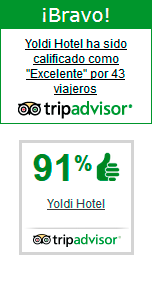 We will definitely repeat in Yoldi when we return to Pamplona.